Hello, Here is a very pretty Porcelain figurine . 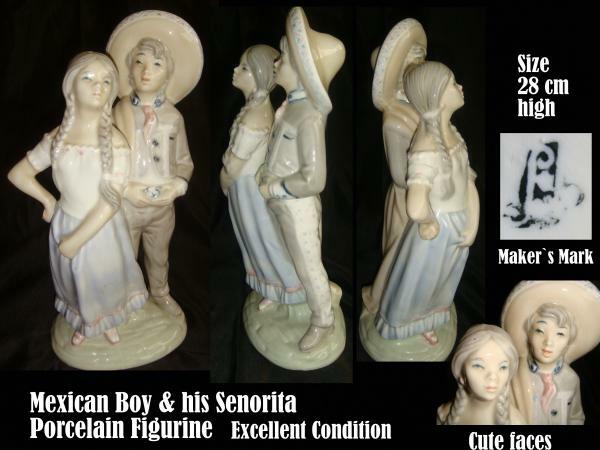 I believe it was made in Spain, but I have not been able to Identify this maker`s mark, which looks to be either a itallic "L"
This figurine is as you can see is of a Mexican looking Boy stood proudly with his Senorita with her hair is two long pigtails. He is wearing the traditional Mexican Sombrero hat so perhaps this was made for the American Hispanic market. The figurine is in EXCELLENT condition no chips or cracks.